The road trip charging war is coming to an end. 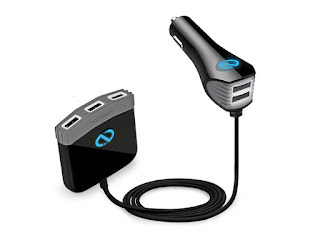 The Naztech Roadstar 5-Port 12A Car Charger & Hub plugs in once and provides five powerful USB ports that deliver 12A of rapid charge to the whole crew's phones, tablets, and any other USB gadgets. Featuring Smart Chip Technology and top-tier security measures, the Roadstar will recognize your device and choose the exact charging protocol for a fast, safe charge.